How well do you react when Hollywood puts a new twist on an old favorite? I ask because some new pictures taken from the set of the upcoming Captain Marvel movie have hit the web and not everyone's taking it so well. Why? Well, rather than her standard red, blue, and gold outfit, Brie Larson is wearing something decidedly more... green. It's definitely not what many expected, and some are calling the color swap out on social media, pointing out that she looks a bit like a Green Lantern, a Power Ranger, or in my own humble opinion, a bit like one of the Halo universe's Spartans (at least from the waist down - it's the leg plating mostly). 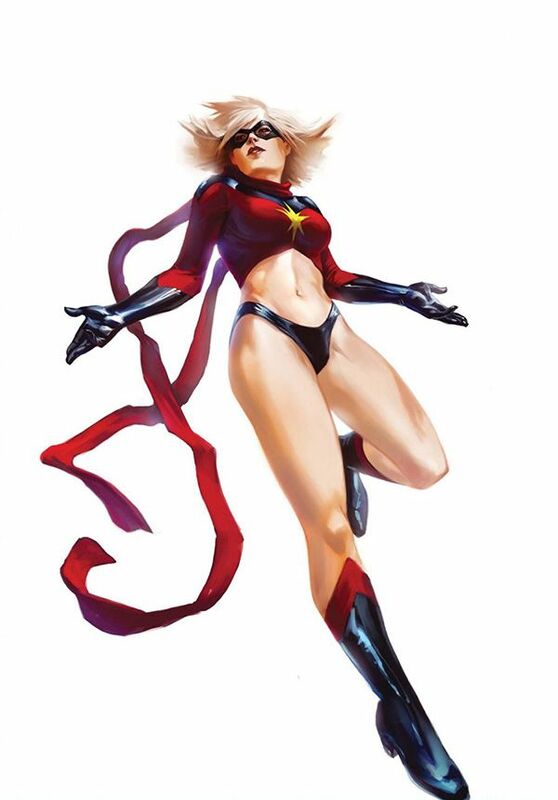 But most seem pretty happy just to have this first look at Carol Danvers, AKA Captain Marvel, in costume. If you go searching the #CaptainMarvel hashtag, you'll see a chorus of "I'm not crying you're crying"s, "She looks so good! "s, "YAAAAAASS QUEEN"s, and a bunch of other praise. A few are also helpfully pointing out that this is most likely early on in Danvers' hero journey, while she's still wearing Mar-Vell's Kree battlesuit. Why yes, I did just throw out several proper nouns and jargon without context. Let me explain: in the comics, Carol Danvers was a pilot for NASA when she met and befriended an alien warrior named Mar-Vell, who was part of the Kree race. For a time, she fought alongside him, and at one point even inhabited his body. A bunch of mind-melding, genetic alteration, and timeline shenanigans later (so, your average comic book hero history) and Danvers decided to take up the mantle of "Captain Marvel" in his honor. And could you guess what color the Kree wore into battle in the comics? That's right, green. Hence, Brie Larson's outfit may not only make logical sense, but be more accurate to the comics than if she had just popped up wearing her red-and-blues. It all depends on how this movie depicts (or doesn't depict) the Kree and another alien race known as the Skrulls. And keep in mind, this isn't a photo being shown off by Marvel, it's a candid set pic - if you want a real idea of how Danvers will look in the movie, you'll need to wait until some official press materials get released. 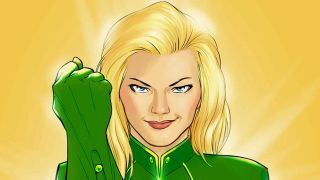 In any case, green or not, this outfit is definitely better than her first costume from the comics.